The Cl (Cl3 to be exact in this case) in the molecular structure has nothing to do with it’s potential health risks. Cl aka Chlorine in it self is toxic yes, but here its a whole different molecule. Take NaCl as an example. This is regular table salt, and essential to the human body. the Cl alone doesn’t mean its toxic. and some flavors also do it. I agree. There is still a need for syringes, or other methods to use for very small measurements. I mix my stevia just to use in an eye dropper. So… does it work? 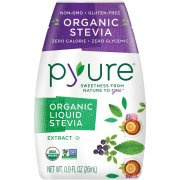 I may need to buy some stevia powder because IMO my organic Stevia (Pyure) Liquid is not sweet at all. Wondering if you notice the vape sweeter using pure powder stevia? I don’t know if it’s any sweeter, but the pure organic powder, mixed in VG, doesn’t have the competing taste(s) with vinegar and citric acid. I may need to buy some stevia powder because IMO my organic Stevia (Pyure) Liquid is not sweet at all. Thanks, What percent is the Liquid Stevia (PYURE) best at, I had problems at first so I just add 0.2-0.5%, is that too low? I use .25-.5% depending on what I use it in. Harsher vapes like chocolate, blackberry, or citrus, I do .5%, and light fruits I use .25%. It’s all based on how sweet you like it though. You can always add more if it’s not enough. I would think 1% would be super sweet if that is what you are looking for, but I haven’t used it that high. I think at first I tried 3 or 5 % in some strawberry ripe and it soured the juice, I tried a second batch thinking i may have had a contaminated bottle and again it soured. So I threw out about 30ml ripe strawberry learning how not to use Stevia. I am interested in other suggested percents used, because I think this is a good additive not because it actually sweetens but the other ingredients (citric acid, vinegar) bring up fruits in the vape. Note: I wonder if my problem with strawberry may be that stevia raises the citrus fruits, and strawberry is not a citrus fruit? Strawberries belong to the rose family with other fruits such as apples, peaches, apricots, cherries, blackberries and raspberries. Citrus fruits belong to the rue family. this makes sense to me? can it be true? When you get time, can you combine the stevia/sucralose/etc threads together? and to follow the results between threads is becoming harder to maintain. Possible? Pyure is just a product name, and comes in different forms, and with different ingredients. like Pyure LS, meaning (L)iquid (S)tevia, or Pyure PSE, meaning §owdered (S)tevia (E)xtract if you make your own stone. Pyure is usually sold at walmart in liquid, granulated, and powder…which should you NOT use? You can usually find pyure at walmart. The preferred pyure [Pyure] referred to on ELR is the 26ml bottle of liquid, although I also make a stone using the pure powder that has no additives. The liquid is hard to dispense from the original bottle, as mentioned above in this thread. The best usage is to re-bottle it, and then use a MICROLITER syringe, not to be confused with a 1ml syringe, or an insulin syringe. The stone can be made using one teaspoon of pure powder to 30ml of VG or PG, then mix very well. You can make a stone with or without the apple cider vinegar and citric acid[lime or lemon juice will work], depending if you use it with fruits or other non-fruit mixes. I just make both. Contains: Water, Organic Stevia Extract, Organic Apple Cider Vinegar, Citric Acid. Good point, thank you. I use and was referring to Pyure LS as pictured by @CosmicTruth. Which threads? There’s only a million of them. LoL. The biggest problem in combining topics that have more than a few posts is that they actually tend to get less cohesive. If you catch them early, they can maintain flow. Otherwise you wind up with a garbled mess. Six in one, half a dozen in the other, ya know? PM links that you think need to be combined and I’ll have a look, though. Here is a tried and tested Pyure clone that is simple to make up. It is also very useful for us Europeans who find the Pyure brand hard to come by, and also the fact you can adapt the ingredients to your own preference? Been looking at getting some pure 100% Sucralose powder and combining it with the stevia powder and ethrytol powder to create a hybrid sweetener for my freakish sweet tooth! Hahahaha! I’m using the now brand better stevia as well. I couldn’t find the pyure brand here in Canada. So far it’s been great. A little goes a long way and it doesn’t burn through coils like sucralose. I was testing it in 10 ml batches and found that it should be kept under 0.5% or it just becomes overly sweet to a point where it ruins the flavour. Yeah, it’s probably futile. I just didn’t know what tools you have even to search with. We can still do our part to link between them, and I will keep my eyes open…maybe there are not as many as I think. Since there are so many newish sweeteners available now, and as @JoJo said combining them at this point would be confusing. I so love all the new info and products that come out as we continue to gain experience and knowledge of vaping, but boy it sure is hard to keep up! Aside from all the things I’ve heard about you, you’re alright.